Our mission is “To help define, build and expand your business”. One of our greatest rewards is to work together with a client for the long term and to be able to see the growth and expansion of their business. Such is the case with Penner & Lewis Rock Technologies. 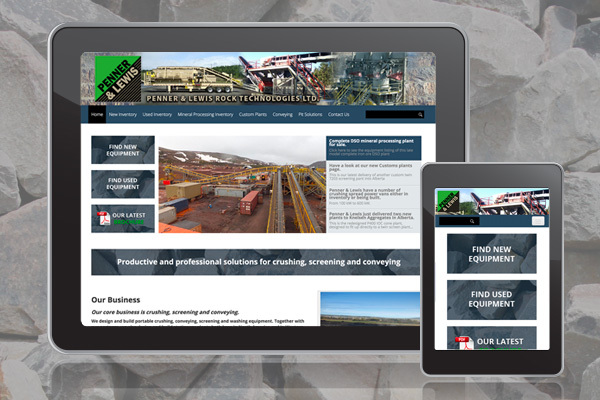 Penner & Lewis Rock builds and supplies specialized equipment in Canada and world wide. We developed a new website for the company in 2011, and launched a complete redesign in 2014. Because the company adds new equipment to their website on a regular basis, they love that they are able to update the website themselves at any time on their WordPress dashboard. NDDesign provides either in-person or online WordPress training for this purpose. We also take care of Penner & Lewis Rock’s regular e-newsletter, from design to send-out.